This Housing Forum inquiry into the future financing and delivery of low cost housing has, over the past six months, explored the context, current approaches and future models for provision against an increasing concern regarding affordability. 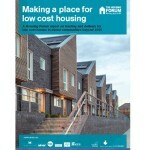 This is largely focused on London and the South East where pressure is greatest but will be extended by The Housing Forum in 2014 through its theme “Building Homes for the Future” into a national study of housing markets. What has become immediately clear is that we are in the midst of the most radical change in the way sub-market homes are provided since the creation of state supplied housing under Clem Atlee 70 years ago. The combination of Welfare Reform and funding principles embodied in the Affordable Housing Programme has created a new dynamic in the relationship between state, provider and occupant, while the impact of the global financial crash has applied a major brake on mortgage availability and prompted prohibitive deposit requirements for new entrants to the market. Moreover, while much attention has been given to the ‘squeezed middle’, there has been a serious decline in activity to support the needs of those who fall below this target group. The Working Group believes that mixed income communities are the lifeblood of strong, sustainable communities. Our work has identified that, such are the complexities of the UK housing market, current changes in policy have the potential to effect dramatic impacts on those living in localities with high land and property values. It is for this reason that we are mainly concerned at this stage with London and the South East. Indeed, if the London property phenomenon continues as many predict, we may be witnessing the beginnings of a demographic shift in population based on economic circumstance that reverses the inward migration sparked by land enclosures in the eighteenth century. Such unintended consequences would have a profound impact on business, local economies, those in need of support from the low waged and importantly, those who provide services in locations to which those impacted migrate. We welcomed the opportunity to contribute to this report (P35) and believe it makes a useful contribution to the housing delivery debate. We agree with the report that as many have said previously, “there’s no silver bullet” and that the issue need addressing on all fronts. For us at C4H we believe this includes, a political will to target the needy, removing housing investment from the PSBR, getting councils building again and finding a solution to viability so that a greater investment flow can be attracted. The security arrangements associated with your web browser may prevent you from downloading the report below. Please do not hesitate to contact us, as we would be pleased to email you a copy.